My obsession with Earl Grey started a few years ago when I first discovered the London Fog at Le Marche St Georges. Coming back from Vancouver, I started making the London Fog regularly and eventually experimented with Earl Grey tea in desserts. Incorporating Earl Grey in ice cream was easy but baking with Earl grey was more challenging especially cookies, meringues, and pavlovas. I’m so excited to share today’s recipe with you, Earl grey pavlova with figs. I can’t say that I’ve mastered meringue or pavlova yet but I’ve learned a few tricks along the way that will help you with your meringue journey. Like macarons, meringue and pavlova are quite fickle. With very few ingredients, egg whites, sugar, cream of tartar, cornstarch, and a tiny amount of vinegar, they’re supposedly simple to make but even the most experienced home bakers find them intimidating. Over the years, this Earl Grey pavlova has grown to be one of my favorite summer desserts when figs are in season. I hope you like this pavlova as much as we do! 2. Line a baking sheet with parchment paper. Draw a 8 by 10 inch rectangle on the parchment paper and dust with powdered sugar to prevent the pavlova from sticking. 3. Add the sugar and Earl Grey tea leaves to a spice grinder and grind until the sugar and tea leaves become powdery. Reserve 2 tablespoons of the Earl Grey sugar for the syrup. 4. Whisk the cornstarch into the Earl Grey sugar mixture until well combined. Adding cornstarch helps prevent the pavlova from shrinking during baking and creates a crispy outer layer. 5. Before placing the egg whites into a mixing bowl of an electric mixer, wipe the bowl clean and make sure that there’s no residual moisture. Any moisture will make it impossible to achieve thick, stiff peaks. 6. Beat the egg whites and whisk on medium speed until it becomes foamy, about 3 minutes. 7. Increase the speed to high and beat until soft peaks form. Add the Earl Grey sugar mixture 1 tablespoon at a time, until all the sugar has been added. Continue to whip until the the egg whites are stiff and glossy and firm peaks form, about 12-15 minutes. 8. Add the vinegar and cream of tartar and fold in gently with a metal spoon to combine. The vinegar creates a chewy pavlova and the cream of tartar helps stabilize the egg whites. 9. Spread the egg white mixture inside the drawn rectangle, making a slight indent in the center. Alternatively you can make 6-8 individual mini pavlova. 10. Reduce the oven to 275 degrees F and bake for 50-60 minutes or until firm to touch. 11. Leave the pavlova in the switched off oven to cool for an hour with the door slightly ajar. 12. To make the Earl Grey syrup, combine 2 tablespoons of Earl Grey sugar with water in a small sauce pan over low heat until the volume is reduced in half. 13. Whip the mascarpone, heavy cream, and powdered sugar together until thick and smooth and soft peaks form. 14. When ready to serve, remove the pavlova from the oven and place on a serving platter. 15. Spread the mascarpone over the center of the pavlova, top with figs and pistachios, and drizzle with syrup. 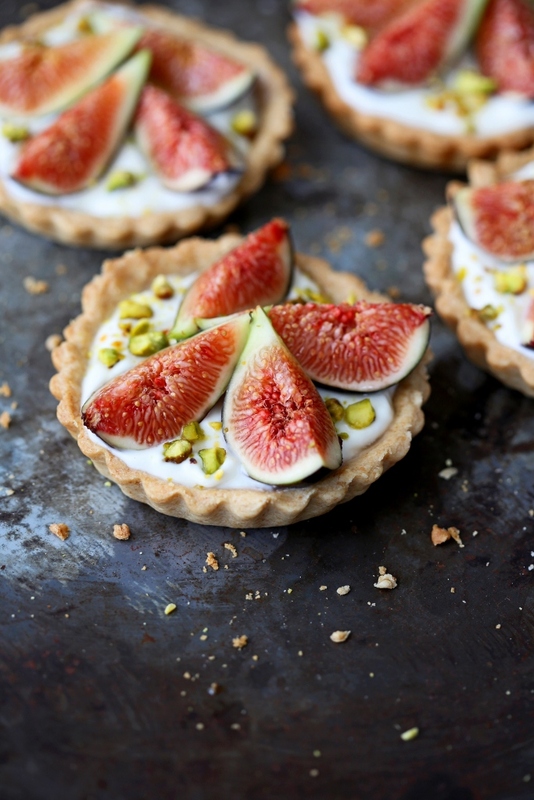 Since figs started appearing at the farmers market, we’ve been making these fig and yogurt tarts a lot. 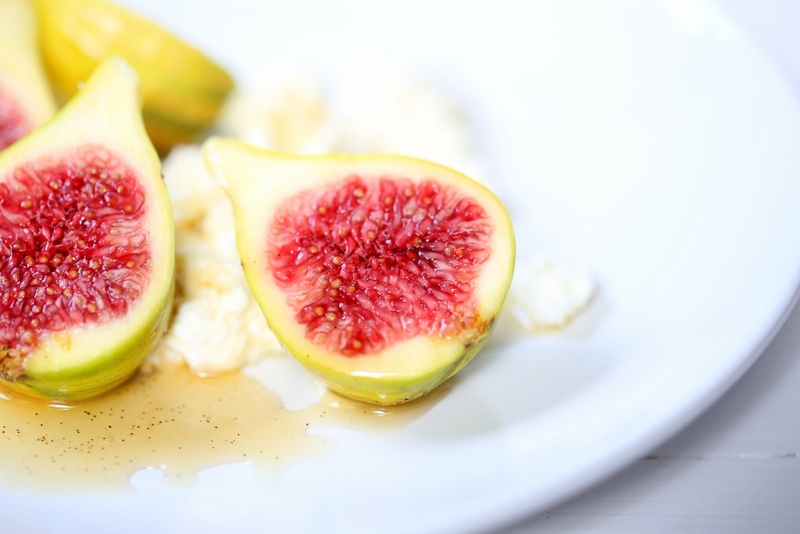 We usually enjoy figs with yogurt and granola when they are in season. Black Mission figs, tiger stripe figs, or brown Turkey figs. We like them all. A few months back, I decided to transform one of our favorite breakfast staples into a dessert when we had friends over for dinner. The dinner menu was pasta and meat centric so I opted to end the night with something light and refreshing. 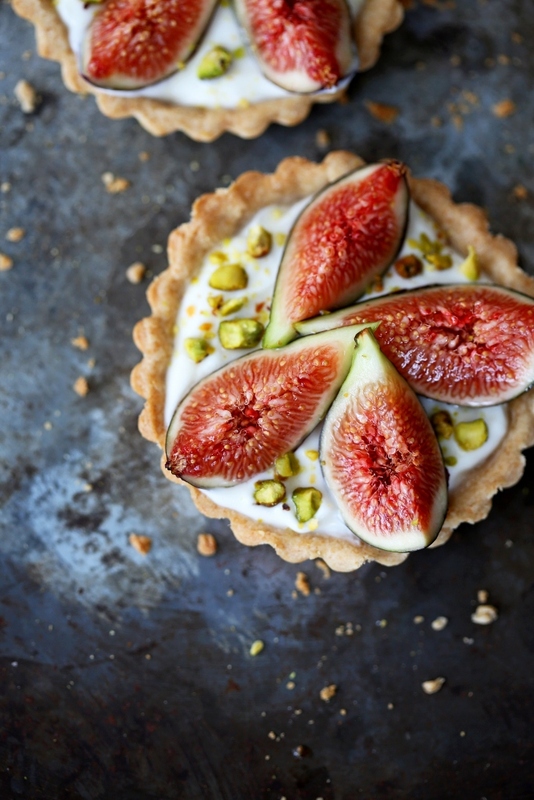 This fig and yogurt tart is our healthier take on dessert. You definitely won’t feel cheated out of a dessert but your body will thank you for not sending it into a sugar high. A lot of people asked for the recipe when they saw the picture featured on the Pure Green Magazine Instagram account so we decided to share the recipe on the blog. Enjoy! 5. Divide the pastry dough into 6 pieces and roll out the dough onto a floured surface to ¼ inch thickness. 6. Line six 4-inch tart pans with the dough and trim the excess. Save the extra dough in your freezer for up to a month. Prick the base with a fork and cover the tarts with plastic wrap and chill for 30 minutes. 7. Preheat the oven to 350 degrees F. Remove the plastic wrap and line the tarts with parchment paper. Fill with baking weights (you can use rice or beans if you do not have any baking weights). 8. Bake for 15 minutes. Remove the weights and bake for another 5 minutes until the pastry is lightly golden. Remove from the oven and let them cool completely while you prepare the filling. 9. To prepare the filling, place the yogurt, mascarpone, and honey in a large bowl and whisk until combined. Refrigerate for 30 minutes or until firm. 11. Divide the yogurt mixture between the cooled tart shells, top with caramelized figs, and garnish with crushed pistachios. I feel so lucky to have such awesome friends at work who are generous and inspirational. They have given me heirloom tomatoes, figs, passion fruits, lychees, guavas, avocadoes, lemons, and herbs from their gardens, as well as many wonderful recipes. 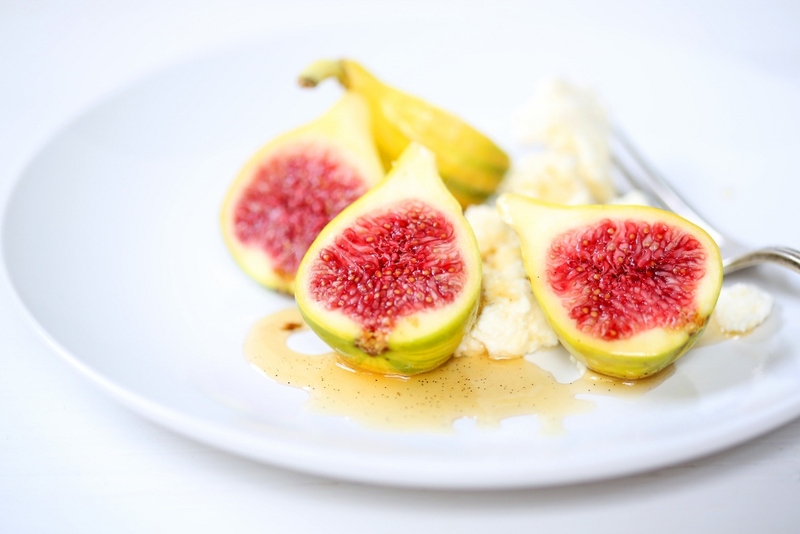 A few days ago, Gail shared with me a simple dessert of homemade ricotta with freshly picked Black Mission figs and honey. It has been on my mind all weekend so I threw together my own version of her dessert. I bought some Panachee figs from the farmers market, made a fresh batch of ricotta, and brought out my favorite honey. 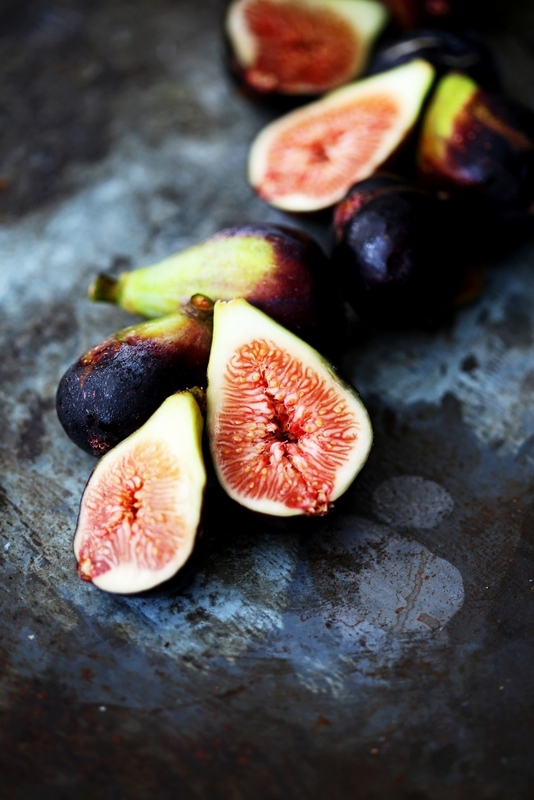 The figs were the star of the dish with their beautiful crimson flesh and strawberry/orange undertone. Simple but satisfying. No recipe needed. I hope you enjoy this dish as much as I did! 1. Cut the figs in halves or quarters and place them on a plate. 2. Add the ricotta to the plate. 3. 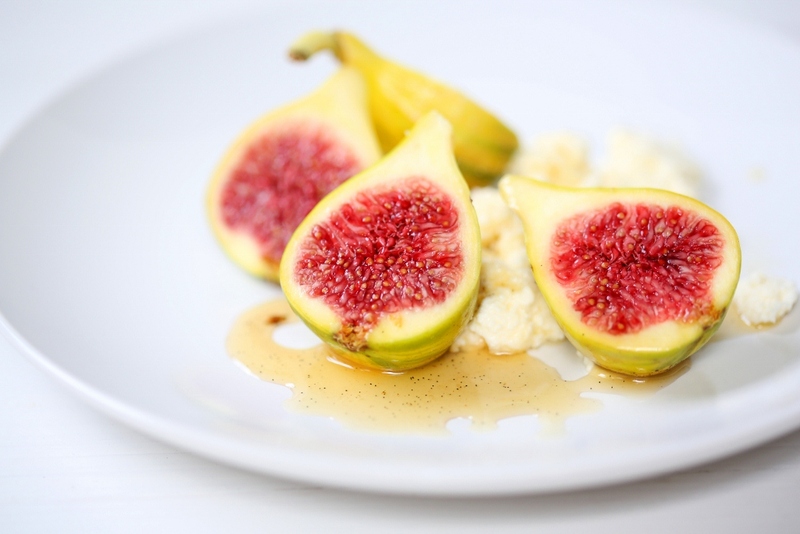 Mix the honey and vanilla bean paste together and drizzle it all over the figs and ricotta.